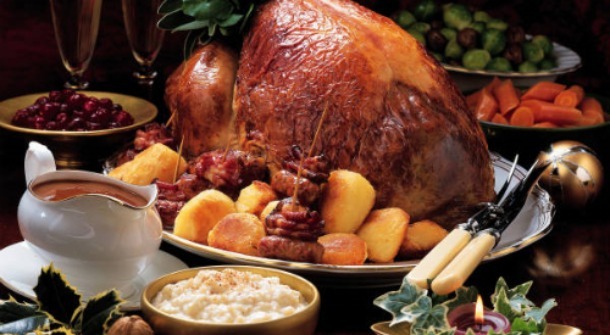 We’ve all had sleepless nights about soggy sprouts, roasties like rocks and laughing gravy (well some of us may have – the sensible among us let the other half, mum or the local best restaurant have the worry). This year however don’t stress – let the experts take the strain! Here is DR’s round-up of the 10 best chef’s tips to ensure your Christmas Day lunch or dinner is a triumph! Gordon advises making a lemon, parsley and garlic butter and massaging that over the turkey – and also under the skin. In his book Christmas With Gordon, he advises: “With your hands, loosen the skin on the breast from both ends of the bird so that you will be able to stuff the flavoured butter underneath it, making sure you keep the skin intact. Repeat with the skin on the legs. From the lower side of the breast feel your way under the skin and out towards the leg, loosening the gap. Stuff half the butter mix into the opened spaces under the skin. From the outside of the skin, massage the butter around the breasts so that the meat is evenly covered.Place the bird in a large roasting tray, breast side up. Spread the rest of the butter all over the skin. Season well with salt and pepper, then drizzle with a little olive oil. Gordon advises leaving the turkey for 45 minutes after you’ve cooked it before serving but keep it covered to retain the heat. Do you use beef dripping, olive oil or goose fat?? Long the subject of Christmas table conversations, Jason from Pollen Street Social tells us to use Goose Fat. Preheat the oven to 220C, place a large roasting tray with the fat in it on the highest shelf to heat up. Peel the potatoes, then cut into even-sized chunks. Boil them for about 10 minutes, until the outer edge is fluffy but they are not totally falling apart. Drain and leave to steam for five minutes over the saucepan to dry them out a bit. Then, give the potatoes a vigorous toss in the colander to roughen up the cooked edges. These fluffy edges are the key to a crispy-edged potato. Take the roasting tray with the hot fat out of the oven and put the potatoes into the pan. Move the potatoes around, making sure each one is covered in fat and give them a sprinkling of salt. Then place them back on the highest shelf of the oven and roast for 40-50 minutes, or until golden brown. Sprinkle with a little more crushed salt before serving. Carrots can be a bit bland and boring but using Heston Blumenthal’s method will certainly liven them up a bit. For six people you will need 750g carrots, peeled and sliced into thick, diagonal chunks. Glaze them in a pan on a low heat with 140g of butter and two teaspoons of caster sugar for 30 minutes before finishing with thyme leaves. Serving 4-6 you’ll need 1kg Brussels sprouts, 25g butter, 100g cooking chorizo, finely diced and 100g chestnuts (tinned or vacuum packed) thyme sprigs, sea salt, ground black pepper. Preheat the oven to 200C/Gas Mark 6. Rinse the sprouts, trim the ends, discard any damaged or dry outer leaves, then cut into 5mm slices. Place on a baking tray and dot with butter, season with salt and pepper then roast for 15 minutes. Remove the sprouts and add the chorizo, chestnuts and thyme and cook for a further 10-15 minutes. The sprouts should be a rich golden colour and soft when pierced, and the chorizo should be piping hot and just beginning to char at the edges. If you want something a bit more interesting than traditional sage and onion, try Hugh Fearnley-Whittingstall’s turkey stuffing. It uses chestnuts, celery, onion, butter, prunes, parsley, egg, the turkey’s liver, trimmed washed and finely chopped, and 50g fresh breadcrumbs. Sweat the onion and celery in the butter over a medium heat for a few minutes until softened. Then add the prunes, cooked and shelled chestnuts and parsley and cook for a few minutes. When the mixture has cooled a little, mix in the breadcrumbs, liver and egg until all the ingredients are well combined. Bake in an oven-proof dish for 30-35 minutes in a fairly hot oven until nicely browned and crispy on top. There isn’t much you can do wrong with these, but there are some tricks that will make them extra tasty. Antony Worrall Thompson recommends using six of your favourite pork sausages and four teaspoons of sweet chilli pickle and 12 rashers of rindless smoked streaky bacon. Cut the sausages length ways and spoon in some pickle before wrapping in bacon and grilling for 15 minutes. Jamie advises a slightly radical idea of preparing the gravy a few days or even weeks before Christmas! He says, “You’ll have it on standby, so you can finish it on the day. I use chicken wings to give it that roasted flavour base. They’re dead cheap and the most flavourful part of the bird.” Jamie roasts the chicken with veg, herbs and star anise, scatters over bacon and then bashes the wings open with a rolling pin. Once roasted put pan on hob and add stock, then using a potato masher to grind everything up using flour to thicken. When its reached consistency strain through sieve then leave to cool and store. On the day, defrost slowly then mix in with Turkey juices and add cranberry sauce to the pan before straining again and skimming off fat. Sounds like rocket fuel! Put them in a pan of water to boil first then into the oven at 200°C/Gas Mark 6 with a bit of oil for 40 minutes, turning once. Cut them in half so they are chunky. Pour on 2tbsp honey and sprinkle over 1tbsp cumin and cook for a further five minutes to glaze. They burn quickly, so keep an eye on them. Nigel keeps his recipe simple, using fresh cranberries, white wine and sugar with a spritz of orange, but says frozen cranberries work perfectly. Tip 250g fresh or frozen cranberries into a pan with 100ml white wine and 100g caster sugar and bring to the boil. Cut a couple of long strips of orange zest into thin shreds and stir into the mixture. Simmer gently for 10 minutes until the berries start to burst. Remove from the heat and beat lightly with a spoon so that some of the berries are broken up. Serve warm. Delia uses a half a large onion spiked with cloves, bay leaves and peppercorns and and boils them up in a pint of milk then leaves it to infuse for a couple of hours. When you are ready to make the sauce, remove everything from milk , stir in 40z bread crumbs and 10z of butter and allow the sauce to thicken over a low heat until the crumbs have swollen. Then stir in 2 tablespoons of double cream and transfer to serving dish. Not a member of Design Restaurants? If you are a foodie and enjoy dining in the best places in the country this membership is for you. For details go to www.designrestaurants.com and join online for just £90 – you can start using your card today!